Never one to mince words, before he was a outspoken NBA analyst, Charles Barkley was one of the greatest power forwards in league history. While an NBA title continuously evaded him during his career, Charles Barkley cards are a popular option for collectors. Shop for Charles Barkley Cards on eBay. The fifth overall pick in the 1984 NBA Draft, Charles Barkley was still dominant despite being undersized for a power forward at 6'6". He spent the first half of his Hall of Fame career with the Philadelphia 76ers and the second half was spilt between the Phoenix Suns and Houston Rockets. Barkley remained productive during his entire 16-year career and averaged a double-double for points and rebounds in every season except for his rookie year. After a more limited start for Charles Barkley cards at the onset of his NBA career, collectors were treated to a good mix of options during the rest of his time in the league and well into his retirement. 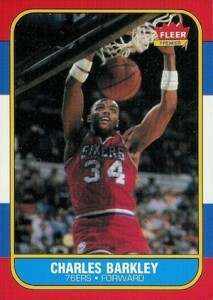 Barkley's first NBA card came in 1984-85 Star and his official rookie came a few years later in 1986-87 Fleer. The first Charles Barkley autograph card appeared in 1992 Courtside, but the most notable early autograph card for Barkley was part of the 1997-98 Skybox Autographics set. Other cardboard milestones include his first memorabilia cards in the 1997-98 Upper Deck Game Jerseys insert set. Unlike many of the top basketball stars of the era, there are not very many autograph or relic cards available for Charles Barkley. 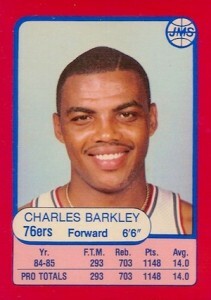 The following list looks at the key early cards for Charles Barkley, including his only rookie card. Even without the official rookie designation, the 1984-85 Star card for Charles Barkley is important to the hobby because it was his very first NBA card. While reprints and counterfeits make things complicated for collectors, BGS grades the popular cards and BGS 9 versions regularly sell for $200+. While Star and Fleer are the main mid-80s brands that collectors are familiar with, JMS was another early card option for Charles Barkley. The limited oddball release was issued in uncut team sheets for the Philadelphia 76ers, Boston Celtics and Los Angles Lakers. The perforated sheets included nine cards for each team and the Charles Barkley card is one of the top options from the 27-card set. Full uncut sheets occasionally surface but they are normally found as individual cards. As the second main Charles Barkley card from Star, the 1985-86 edition is much less popular or valuable than his first Star card. The all-white design does give it a distinct look and it still predates his Fleer rookie by one year. 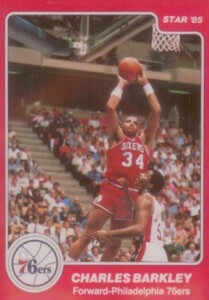 1986-87 Fleer brought collectors the official rookie card for Charles Barkley and easily his most popular. Although ungraded and low-grade versions can regularly be found in the $25-50 range, high grades can still see strong values. A PSA 10 sold for $1,375 in December of 2014. 2018-19 PRIZM CHARLES BARKLEY GREEN PRIZM #3 SIXERS! 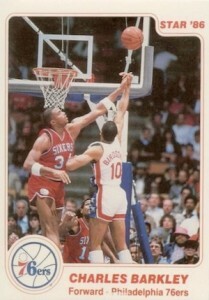 HOF CARD..
1987 Fleer #9 Charles Barkley Philadelphia 76ers HOF PSA 9 " SHARP CORNERS "